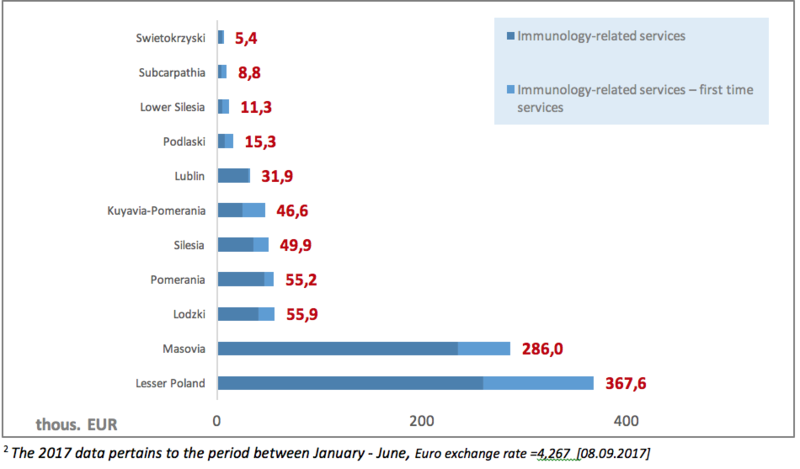 Primary immunodeficiencies – epidemiology, spending on therapy, diagnostic and therapeutic needs in Poland. Department of Internal Diseases, Pneumonology, Allergology and Clinical Immunology, Military Institute of Medicine , 04-141 Warszawa, Szaserów 128 Str. Department of Clinical Immunology, Institute of Paediatrics, Jagiellonian University Medical College, and University Children\\\'s Hospital, 30-663 Krakow, Wielicka 265 Str. Department of Clinical Immunology, Center of Oncology in Lublin, 20-090 Lublin, dr K. Jaczewskiego 7 Str. Primary immunodeficiencies (PID) are a heterogeneous group of over 300 diseases of the immune system characterised by its disfunction, and in consequence by chronic or recurrent infections, autoimmunity, allergy, neoplastic diseases or autoinflammation (1). One of the key problems at the international level is low awareness of symptoms and course of primary immunodeficiency. Based on the epidemiological data on the disease incidence, it can be estimated that ca. 70-80% of PID cases have still not been diagnosed (2). The main issue on the country level is the lack of large scale analyses concerning the actual number of PID patients in Poland, which limits the potential to streamline the disease diagnostic and therapeutic process. The following paper is an attempt to prepare a synthetic summary of epidemiological data and main problems related to PID diagnostics and therapy in Poland and to present the costs of reimbursed healthcare services related to this group of patients. Primary immunodeficiencies (PID) are a heterogeneous group of the immune system diseases characterised by its dysfunction, and in consequence by chronic and recurrent infections autoimmunity, allergy, neoplastic diseases or autoinflammation. Primary immunodeficiencies are genetically determined although particular molecular defects are often not (or not yet) defined. They occur in families or are of sporadic character. After over 60 years of the first diagnosed PID case until today nearly 300 disease entities belonging to this group have been identified and this number is constantly growing (1). PID patients are often susceptible to recurrent or chronic infections (bacterial, viral, fungal, and parasite invasions), they can also suffer from a host of other diseases. The key steps aiming to diagnose this disease include a detailed interview conducted by a primary healthcare professional, and a physical examination. Another obligatory stage of the diagnostic process allowing to link clinical symptoms with specific immunity disorders is a cycle of gradual, increasingly detailed lab tests. Specialised genetic tests are characterised by a high potential in the area of early PID diagnosis, allowing (in case of some PID types) to confirm the presence of mutations responsible for the disease that have been identified so far (3). The choice of the PID therapy is determined by the diagnosed disease sub-type. The main treatment method utilised for the majority of most often diagnosed PID cases is the substitution therapy with immunoglobulins which is usually a life-long treatment (4). The following article is an attempt to prepare a synthetic summary of epidemiological data concerning PID in Poland, to point out the main problems related to access to diagnosis and to therapy, and to present the main costs of reimbursed services related to this group of diseases. According to Jeffrey Model Foundation data, 57% of primary immunodeficiencies are diagnosed in men, and 43% in the female population (5). 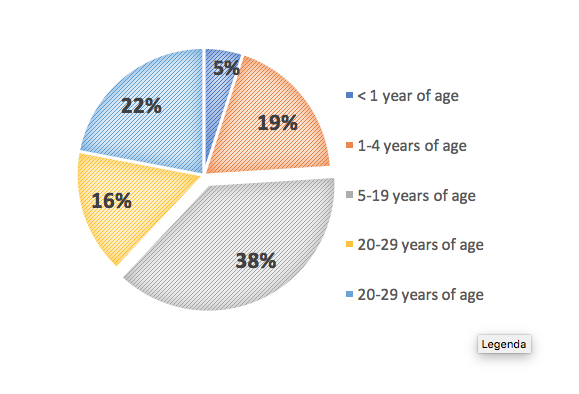 The age group in which PID is diagnosed most often is from 5 to 19 years of age (38%). The share of primary immunodeficiency diagnosis in patients aged under 1 year accounts for a mere 5%. What is noteworthy is that 22% of PIDs is diagnosed at age 40 or later, in spite of the fact that this is an innate disorder of genetic origin (5). The key sources of epidemiological data on PID are patients’ registers run at both international and national level. The data found in the registers is based exclusively on diagnosed cases and is most often considerably underestimated, mainly due to high percentage of undiagnosed patients in the PID population, but also due to limited number of physicians collecting regularly the clinical data. Ca. 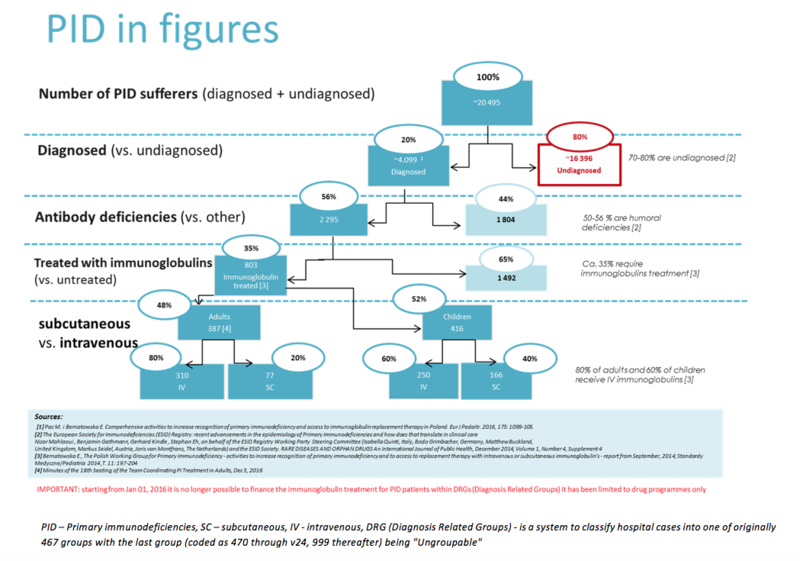 70-80% of PID cases remain undiagnosed and are not entered into patients’ statistics (2). It is estimated that globally ca. 6 million patients suffer from PID, including ca. 638 000 in EU countries (both diagnosed and undiagnosed cases) (6). Scientific publications estimate that in Poland ca. 20 000 individuals suffer from PID, including only 4 000 -5 000 cases that have been diagnosed (7). Based on the number of PID cases reported in the registry of European Society for Immnunodeficiencies (ESID) the prevalence rate for Polish population is 1.44/100 000 inhabitants (8). All the following figures are based exclusively on documented cases and are minimal values. Figure 1. 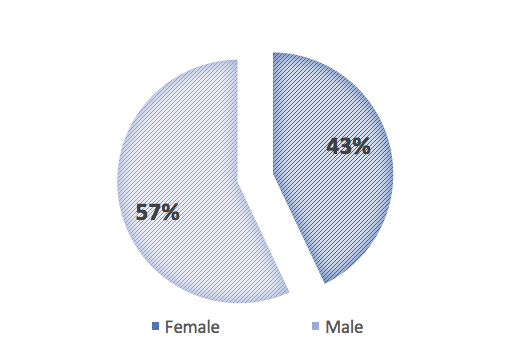 Global PID incidence split by gender, according to ESID data. Figure 2. Global PID cases split by age of diagnosis, according to ESID data. The epidemiological situation of PID patients in Poland has been estimated based on scientific sources and assumptions made. Figure No 3 presents the estimated number of PID cases that until 2014 could amount to over 20 000, including 4 099 already diagnosed patients, according to the Polish Working Group for Primary Immunodeficiencies (Polska Grupa Robocza ds. Pierwotnych Niedoborów Odporności) (7). Based on the abovementioned data and the National Health Fund (NHF) figures, the number of patients treated with immunoglobulins (35% of all diagnosed PID cases) and not treated with immunoglobulins (65% of diagnosed cases), as well as the number of patients treated with different immunoglobulin products (IV - intravenous and SC - subcutaneous) have been estimated. Early primary immunodeficiency diagnosis is particularly important as it allows to avoid recurrent infections and severe complications. The analysis of the diagnostic journey of PID patients has revealed some alarming elements, the so-called ‘gaps’ in patients’ access to PID diagnostic services. In Poland basic PID diagnostic tests (such as the assessment of IgG, IgA and IgM levels or the assessment of peripheral blood lymphocyte subpopulations) are not included in the catalogue of guaranteed services. Because of high specificity and costs of such tests, primary healthcare professionals are reluctant to refer patients to them, and patients might have difficulties or even might not be able to afford such high out-of-pocket costs. Another vital problem is also an insufficient number of immunologists. According to the database led by the Supreme Medical Council (Naczelna Izba Lekarska, NIL), by the end of 2016, there were only 100 physicians specialised in this field, but in 3 provinces there was not a single immunologist (9). There are also certain geographic barriers resulting from uneven distribution of immunology out-patient clinics – they are found only in 12 centres in Poland, located in large cities. In this context, the resulting problem is very long waiting time for visits, which in extreme cases may exceed 7 months (10). Another element of the diagnostic process in many cases should be a genetic PID test, which is an important element that can either define or confirm the diagnosis. In 2014 there were 98 physicians specialised in genetics in Poland, but there was not a single healthcare professional specialised in this field in the Lubusz, Opole and Subcarpathia province . At the same time, it seems noteworthy that the molecular diagnostics is the most expensive element of the diagnostic process – particular tests can cost up to EUR 420 or even more . Since genetic tests are not financed by the NHF, patients often cannot pay for them out-of-pocket due to financial constraints. University Children’s Hospital of Cracow is the only centre in Poland financing genetic diagnosis of primary immunodeficiencies. The costs of tests are funded as donations by pharmaceutical companies. Another problematic issue is also low NHF spending on PID diagnostic services (clinical immunology). The value of contracts signed by the NHF in 20172 for outpatient healthcare in the area of clinical immunology amounted to EUR 933.9 thous., including 26% on contracts for first-time services. The highest value of contracts could be observed in the Lesser Poland province: 367.6 thous. EUR. The PID diagnostic process can also be carried out in the hospital settings. 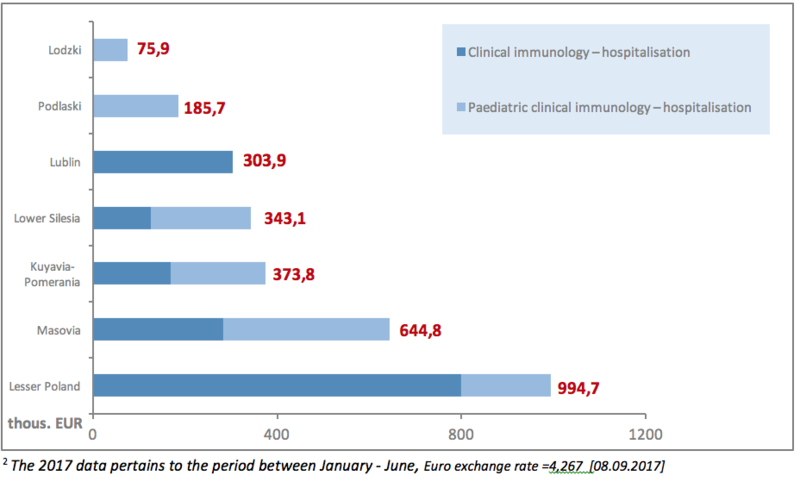 Excluding agreements for drug programmes, the value of contracts signed by the NHF in 20172 for inpatient clinical immunology services amounted to EUR 2.9 million, including EUR 1.2 million (42%) spent on contracts for paediatric treatment. The total NHF spending on clinical immunology services in 20172 amounted to EUR 3.8 million. As it has been observed, there are major disproportions in spending on diagnostics: EUR 933 thous. 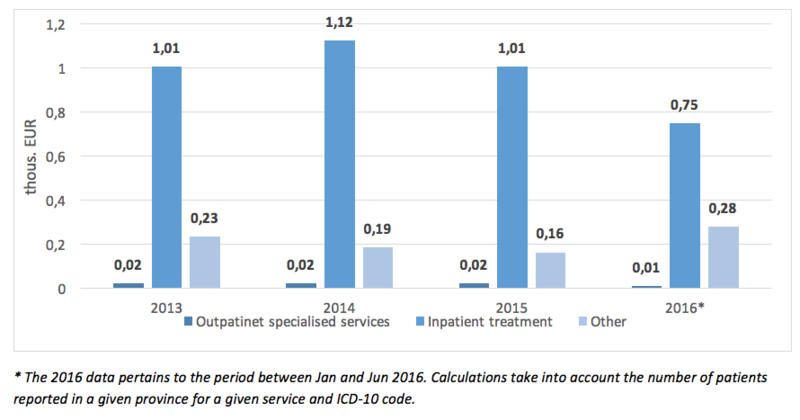 on outpatient services compared to over EUR 2.9 million on inpatient care. In Poland the process aiming to ensure an access to a given therapy for patients is initiated by a pharmaceutical company (marketing authorisation holder) with a request of medicine reimbursement submitted to the Ministry of Health (MoH). It commences a multi-stage administrative process. In the event of innovative therapies, each application is analysed and assessed by The Agency for Health Technology Assessment and Tariff System (Agencja Ochrony Technologii Medycznych i Taryfikacji, AOTMiT), and then submitted one more time to the Minister who along with Economic Committee (Komisja Ekonomiczna) holds price negotiations and agrees on other medication financing terms. If the entire process is successful a requested medication is included into the reimbursement list. Furthermore, each new drug programme, in order to be implemented by hospitals, has to be a subject of a tender announced by provincial NHF branches based on terms specified in directives issued by the Head of the NHF (from the mid-2016 also a directive issued by the Minister of Health on the terms of service providers’ offer assessment). According to current regulations, the Ministry of Health generally has 180 days (for medications reimbursed at pharmacies) or 240 days (in case of drug programmes) to evaluate applications for reimbursement (from the moment when the application is submitted to the moment when the decision is issued).This period can be prolonged due to administrative character of the reimbursement procedure (complementing, suspending). 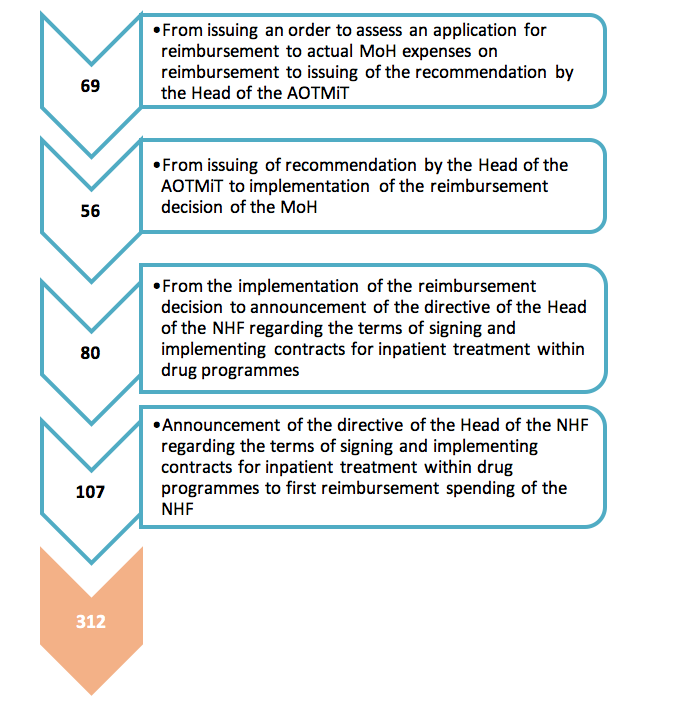 However, the time from issuing the reimbursement decision and including the medication into the reimbursement list to the moment when the new therapy starts being financed by the NHF has not been specified by the regulations. The analysis of publically available information about the reimbursement process: from an order for assessment of a reimbursement application by AOTMiT issued by the MoH, to the moment when the therapy is accessible to patients in practice (when public means are spent on reimbursement), allows to assess the real time after which the patient can take advantage of the most advanced therapies. In this context, the process has been analysed – from the moment when the MoH provides the AOTMiT with a request to asses an application for reimbursement to the first spending on reimbursement. It took 312 days for the ‘Primary immunodeficiency treatment in adult patient’ drug programme to enter the reimbursement list (the mean time for various products used within the drug programme). 187 days passed on average from the moment when the reimbursement announcement was issued to actual reimbursement expenses, i.e. implementation of procedures involving the NHF and service providers. B.17 ‘Paediatric primary immunodeficiency therapy’ (programme commenced in 2012) – children’s treatment financed in both inpatient and home setting (with SC products). B.78 ‘Primary immunodeficiency treatment in adults with the use of normal human immunoglobulin administered with recombinant human hyaluronidase’ (since July 2016) – adults’ treatment financed in both inpatient and home setting (with fSC product). In the context of drug programmes, the key problem is the limitation resulting from the content of the B.17 programme: ‘Paediatric primary immunodeficiency therapy’. According to the content of the programme, SC immunoglobulins are dispensed for home use only by facilities with an outpatient Immunology Clinic or Immunology Ward. Unfortunately not all the facilities that have signed a contract for the B.17 programme have such immunology clinics or wards, therefore home treatment with SC immunoglobulins is not possible there. Table 1. Immunoglobulin products available in Poland and availability category (18). When assessing the availability of particular services, one should pay particular attention to the value of NHF contracts signed by particular NHF provincial branches (NHF PB). It can be assumed that the PB characterised by the highest value of the contract should at the same time ensure higher availability of services for patients. In 20172 the value of NHF contracts within the ‘Primary immunodeficiency therapy in adults’ amounted to EUR 4.04 million, with 92% (3.7 million) spent on medications. The highest value of services within this programme was contracted by the Lesser Poland PB of the NHF (EUR 963.1 thous.). The value of contracts within the ‘Paediatric primary immunodeficiency therapy’ in 20172 amounted to EUR 1.74 million, with ca. 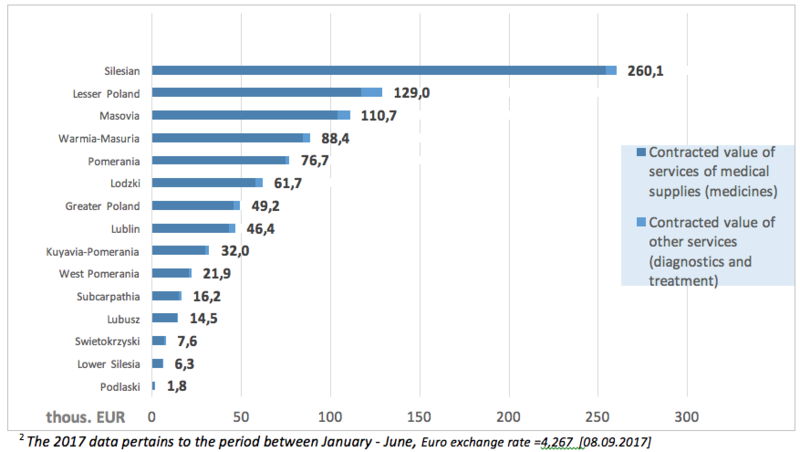 87% spent on medications (EUR 1.5 million). 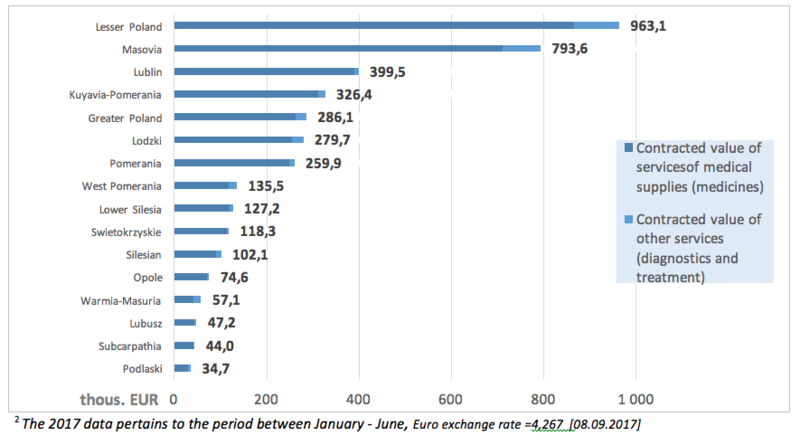 The highest value of contracts was reported in the Masovia province: EUR 430 thous. Since the introduction of another programme entitled: ‘Primary immunodeficiency therapy in adults with the use of normal human immunoglobulin administered with recombinant human hyaluronidase’ expenses within this programme, amounting to ca. EUR 922 585 until the June 20172 (13). The following charts present the value of contracts for services signed by particular provincial NHF branches. Figure 9. Value of NHF contacts in 20172 within PID drug programme ‘Primary immunodeficiency therapy in adults’, excluding contracts concerning drug programme coordination (in thous. EUR) . Figure 10. Value of NHF contacts in 20172 within PID drug programme ‘Paediatric immunodeficiency therapy in adults’, excluding contracts concerning drug programme coordination (in thous. EUR) . Figure 11. Value of NHF contracts in 20172 within the ‘Primary immunodeficiency therapy in adults with the use of normal human immunoglobulin administered with recombinant human hyaluronidase’ programme (in thous. EUR) . In 2015 the cost incurred by the NHF on PID treatment-related services amounted to EUR 18.9 million (the costs of hospital treatment, specialist outpatient care, medical rehabilitation, services offered within separate contracts, caring services, palliative and hospice care) and increased by EUR 470 thous. compared to 2014. Since January to June 2016 the NHF spent EUR 8.2 million. The NHF costs in 2015 included mainly the costs of hospital treatment of PID patients (93%), the costs of outpatient specialised services accounted for ca. 5%, and that of rehabilitation, care services, palliative care and other services for another 2%. There was an increase in costs incurred by the NHF on specialised services between 2013 and 2016, whereas the cost of hospital treatment declined. *The 2016 data pertains to the period between Jan and Jun 2016. In 2013 - 2015 we could observe an increase of spending incurred by particular provincial branches on services related to PID treatment. The highest expenses were incurred in 2015 by the following branches: Masovia (ca. EUR 3.7 million) and Lesser Poland (ca. EUR 3.5 million). * The 2016 data pertains to the period between Jan and Jun 2016. The mean cost of hospital PID treatment per patient in 2015 amounted to EUR 1 200 and dropped compared to 2014 by EUR 140. A decline of NHF spending on PID therapy can also be observed in regards to rehabilitation, care services, or palliative care offered to this group of patients. The highest total NHF spending on PID treatment in 2013 – 2015 could be observed for code D83 (Common Variable Immunodeficiency), and the lowest for code D71 (Functional Disorders of Polymorphonuclear Neutrophils). The Social Insurance Institution (Zakład Ubezpieczeń Społecznych, ZUS) research devoted to causes of both short-term and long-term incapacity for work carried out for years by analysing medical certificates to an accuracy to disease entity defined in line with the International Classification of Diseases Revision Ten (ICD-10), defined by ICD-10 codes: D70 Neutropenia, D71 Functional disorders of polymorphonuclear neutrophils, D80 Immunodeficiency with predominantly antibody defects, D81 Combined immunodeficiencies, D82 Immunodeficiency associated with other major defects, D83 Common variable immunodeficiency, D84 Other immunodeficiencies, D89 Other disorders involving the immune mechanism, not elsewhere classified, G11 Ataxia telangiectasia. The data does not include undiagnosed PID cases (in the system they are usually reported under other ICD-10 codes than the abovementioned ones). In 2015 in the registry of medical services run by Social Insurance Institution were 471 400 medical certificates pertaining to temporary inability to work due to diseases from the PID category. If we consider gender, most medical certificates were issued for women (60 % vs. 40 % for men). In regards to the age, the highest proportion of sick leave certificates were issued for individuals aged 55 - 59 (14.1%), and the lowest to those aged under 19 (1.5%). In 2015 Primary Immunodeficiency Disorders (PID) were the cause of 5 456 days of absence from work (15). Figure 17. Work absence due to PID among individuals insured at The Social Insurance Institution in 2015, split according to the age of the insured . In 2015 The Social Insurance Institution issued 328 certificates of permanent incapacity for work, including 193 for men (58%) and 133 for women (42%). Among all the certificates issued ca. 61% (199) pertained to partial incapability to work, ca. 27% (90) to total incapability to work, and 12% (39) to inability to exist independently. Spendings on PID-related benefits linked to incapability to work in 2014 amounted in total to EUR 2.68 million, with the highest cost accounting for 60% of this sum (EUR 1.6 million) generated by incapability benefits, and the lowest by medical rehabilitation (EUR 526). The cost of the absence from work in 2014 amounted to ca. 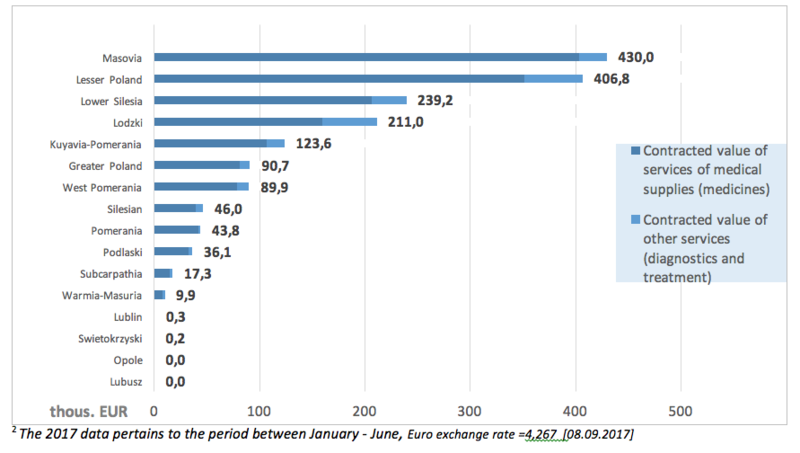 EUR 372 thous., accounting for 14% of all the expenses incurred by The Social Insurance Institution on PID. At the time being PEX PharmaSequence is preparing a report called ‘Pierwotne Niedobory Odporności - Stan obecny oraz potrzeby diagnostyki i terapii w Polsce/Primary Immunodeficiency – status quo and therapeutic and diagnostic needs in Poland’ (16), which is the first paper devoted to PID of this type ever published in Poland. The report discusses in detail issues related to financing services offered to PID patients by the public payer. The key serious problem pertaining to PID diagnostics and treatment is too low awareness of symptoms and course of the disease. Based on epidemiological data concerning PID incidence, we can draw a conclusion that most disease cases have not been diagnosed yet. Another key problem is also the lack of large-scale analyses concerning the actual number of PID patients in Poland. The detailed analysis of all the availability of PID diagnostic and therapeutic services in Poland has allowed to identify the main barriers hindering access to them for the patients. One of the key barriers in relation to primary immunodeficiency diagnostics is the lack of financing of basic immunology tests within the basic guaranteed health benefits package. Another vital aspect is too small number of immunology clinicians and geneticists, which results in longer waiting time for consultations. At the same time, high cost of genetic tests and their insufficient reimbursement are highly limiting for healthcare professionals and for patients who cannot afford to pay for them out of pocket. There are 14 immunoglobulin products for primary immunodeficiency therapy financed within three drug programmes available in Poland. The duration of the process of introducing medications to the reimbursement list within drug programmes dedicated to adult patients is 312 days vs. 240 days set forth by the law. Another problem hindering the access to treatment within drug programmes is the limitation resulting from the requirement included in the description of the B.17 ‘Paediatric primary immunodeficiency therapy’ Drug Programme. According to the content of the drug programme, SC immunoglobulin products can be dispensed for home use only by facilities having an Immunology Clinic or an Immunology Ward. Not all the facilities that have signed the B.17 programme have immunology wards or clinics, which is why outpatient SC immunoglobulin treatment is not possible there. Primary Immunodeficiency is also a financial burden from the point of view of The Social Insurance Institution. In 2015 the spending on benefits related to PID amounted to EUR 2.68 million, including 60%, of the cost of incapacity benefit. What is also noteworthy is that only in 2015 PID was the cause of 5 456 days of absence from work. To summarize, it seems advisable to take steps necessary to increase the PID awareness among physicians and administrative units responsible for creating and implementing health policy in Poland. What needs to be optimised is the functioning principles behind diagnostic services, availability of specialists, and access to medications in the outpatient setting. 1. Bousfiha, A.; Jeddane, L.;, Al-Herz, W.; et al. the 2015 IUIS Phenotypic Calssification for Primary Immunodeficiencies. J Clin Immunol. 2015, 35 (8): 727-38. 3. Brzustewicz, E.; Bryl, E. Przegląd testów laboratoryjnych przydatnych w diagnostyce pierwotnych niedoborów odporności. Forum Medycyny Rodzinnej. 2014, 8: 27-36. 5. Modell, V.; Knaus, M.; inni. Global overview of primary immunodeficiencies: a report from Jeffrey Modell Centers worldwide focused on diagnosis, treatment and discovery. Immunol Res. 2014, 60: 132. 6. Bousfiha, A.; Jeddane, L.; Ailal, L. Primary immunodeficiency diseases worldwide: more common than generally thought. J Clin Immunol. 2013, 33: 1. doi:10.1007/s10875-012-9751-7. 7. Pac, M. i Bernatowska, E. Comperhensive activities to increase recognition of promary immunodeficiency and access to immunoglobulin replacement therapy in Poland. Eur J Pedaitr. 2016, 175: 1099-105. 8. Mahlaoui, N.; Gathmann, B.; i inni. The European Society for Immunodeficiencies (ESID).Registry: Recent advancements in the epidemiology of Primary Immunodeficiencies and how does that translate in clinical care. An International Journal of Public Health. 2014, 4: 26-27. 12. Uniwersytecki Szpital Dzięcięcy w Krakowie. Dane dotyczące kosztów badań genetycznych w Uniwersyteckim Szpitalu Dziecięcym w Krakowie. 2016. 14. Zakład Ubezpieczeń Społecznych. Absencja chorobowa w 2015 roku. s.l. : Departament Statystyki i Prognoz Aktuarialnych ZUS, 2015. 15. PEX PharmaSequence: Dylewska, M.; Żmiejko, S.; Mikułowska, M.; Falkiewicz, B. Pierwotne Niedobory Odporności - Stan obecny oraz potrzeby diagnostyki i terapii w Polsce." Warszawa, 2017. 16. Narodowy Fundusz Zdrowia (NFZ). Dane uzyskane na zapytanie dotyczące kosztów poniesionych w ramach leczenia PNO w Polsce. 2016. 17. Mikułowska, M., Kiełczewski, T., Majda, M., Jarosz, A., Cudny M. Terminy w programach lekowych. Warszawa : Sequence HC Partners, 2015.